Libya’s Tripoli-based Ministry of Health has distributed 20 power generators to various health centres (Photo: Ministry of Health). The Presidency Council’s Ministry of Health announced yesterday that it has distributed 20 power generators to a number of public, specialist, and village hospitals and health centres. The Ministry said that the provision of medical services had been affected in most health facilities owing to the long hours of power outages, and as a result, its Emergency Committee had addressed the crisis by allocating the required funds needed. 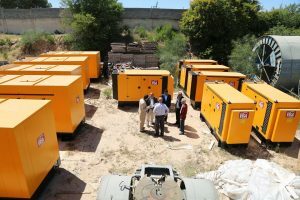 The 20 generators were supplied by thE Electric Construction Company, owned by the state-owned General Electricity Company of Libya (GECOL). The Ministry of Health said that the first phase included seven village hospitals spread across the country and that it aimed during the second phase of its plan to concentrate on supplying generators to primary health care centres. in over 15 different hospitals across Libya in 2017. The programme is expanding its roll-out in 2018. On another note, the US and Libya announced earlier this month joint cooperation in an attempt to reform the Libyan electricity sector. The distribution of power generators to Libyan hospitals comes as part of a wide reform plan for Libya’s ailing health sector announced by the Serraj-led Presidency Council.